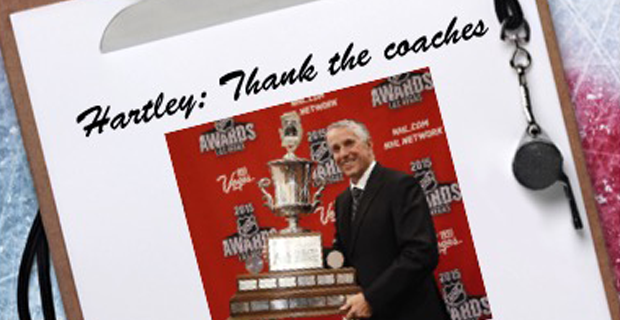 Calgary Flames coach Bob Hartley never spent a day coaching minor hockey. He went from working in a windshield factory in Hawkesbury, Ontario, to coaching the community’s Junior A club, then to major junior, the AHL and finally the NHL. Think about that for a moment. The remarkable athletes who win individual awards nearly always thank their families and supporters and many do recognize those in minor hockey who helped them. But for a coach to do it, especially one who was never in minor hockey, is a testament to a fellow who truly recognizes and appreciates who buttered his bread. He doesn’t get to coach these athletes unless there are legions of volunteers preparing them for years. The acknowledgment probably went unnoticed by most. When you’re at the top of the mountain, does it matter how you got there? The recognition junior coaches regularly get for honing good players into great ones and preparing them for a life in the gilded bubble of NHL stardom is commonplace. But what about before then? Believe this: at one time, Flames captain Mark Giordano didn’t know how to skate. And when he learned to skate, he probably couldn’t turn or pivot well. A minor hockey coach showed him how. Somewhere, too, a minor coach gave Johnny Gaudreau a few shooting tips. That these boys and others became NHL players couldn’t have been predicted when they were eight. Their coaches were just doing what they do with everyone else. As a result, the time spent in minor before the glory years of midget and junior just dissolves into memory. Probably many NHL coaches would agree that they owe a certain debt to the people who first set their players on the right path. I’m not sure how many would publicly express it as Hartley did, not in a media scrum after a game, but after winning a major award on stage in Las Vegas. Certainly, Hartley is a class act. Those of us who’ve met him and spent some hockey time with the man know it. There’s no pretense here. Bob is genuinely thankful for what he’s earned and appreciates the skill and work ethic of his players, not to mention the nature of their roots. Now he’s shared that belief with the world.